Growing up, my mom hated any sort of pet with hair or fur. I always wanted a puppy, but never got him. The only pet my mother could tolerate were fish. We had various fish during my childhood. Now that I am older, fish don’t excite me as they once did. However, if they still do, here are 2 things you may want to check out. Have you ever wanted to see the inside of your as your pet fish see it? 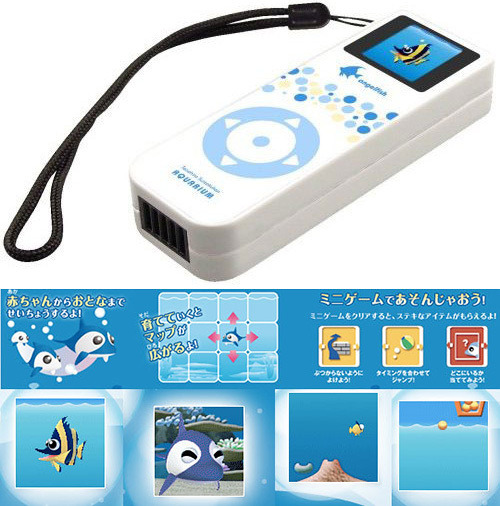 Japan Trend Shop sells the Aqua Eye, a mini underwater video camera for your aquarium. The tiny 2.7 megapixel video camera camera comes equipped with 4 LED lights to light up your underwater subject. I can imagine that this will be used for more than just figuring out what your fish do when they hid in that ceramic house you have in your tank. If the work associated with keeping up a fish tank just isn’t your thing, but you do like fish, you may want to check out Sega’s pocket aquarium. It’s somewhat like a fish tomagatchi, but with much better graphics. You have your choice of system, each equipped with a different type of fish. OhGizmo! suggests parents buy this for their child before they decide to get them the real thing. Kinda gauging dedication. Good idea, but for $59, might as well just buy them a goldfish. Japan Trend Shop & OhGizmo!